Rapper Pusha T made it official today by marrying his beautiful fiancée, Virginia Williams, in Virginia. Pusha T is officially off the market. The rapper and G.O.O.D. Music president married his beautiful fiancée, Virginia Williams, in front of family in friends in Virginia on today (July 21). Pusha’s brother, No Malice, officiated the ceremony and Pharrell Williams was his Best Man. 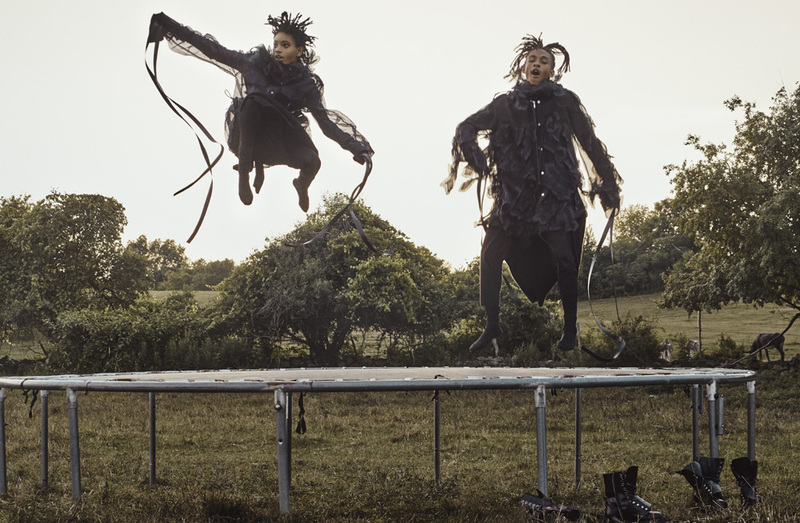 Jaden and Willow Smith bring their sibling slay to the pages of Interview magazine. 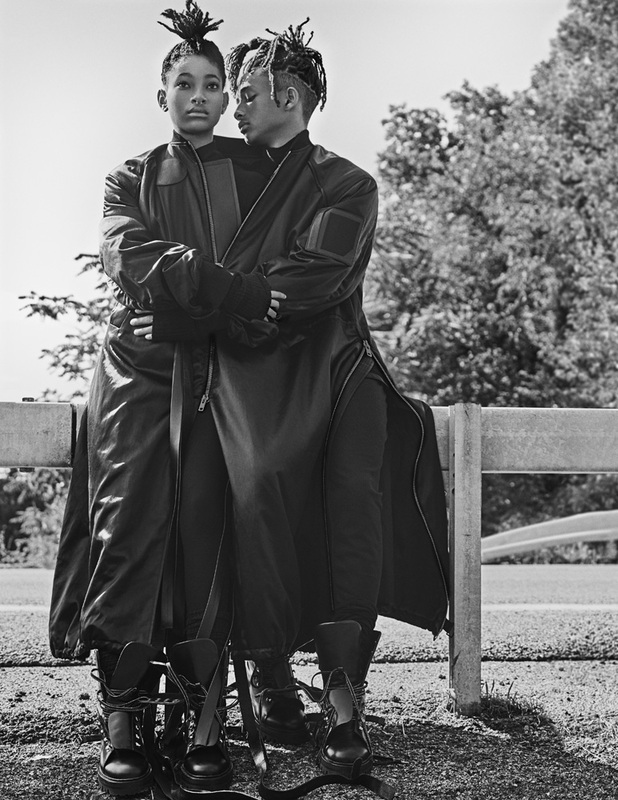 For their cover story, the brother-sister duo were interviewed by Pharrell Williams. PHARRELL WILLIAMS: So, what’s up, guys? What’s on your mind, Willow? 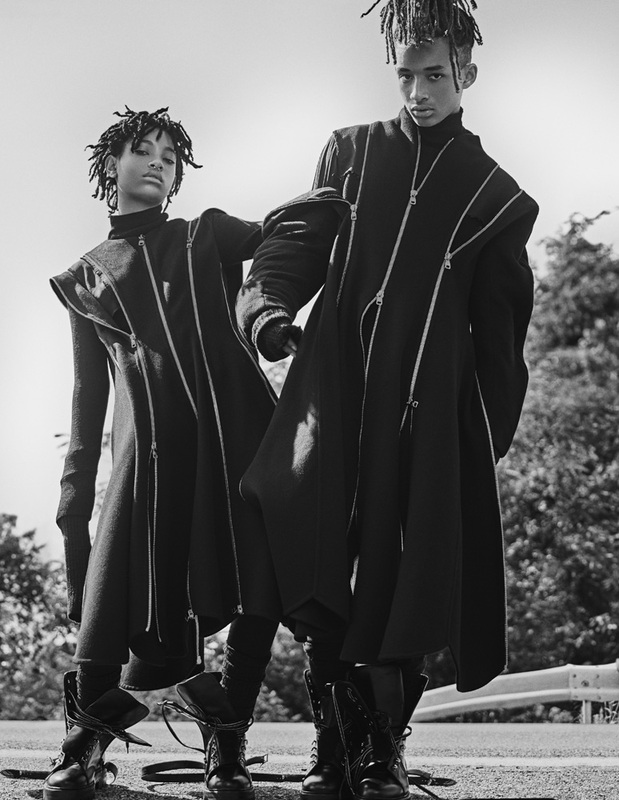 WILLOW SMITH: This morning actually was pretty intense because I was thinking about the world and my place in the world, things that I have made or want to make. I was thinking about all the things that I could do that I don’t do. But, you know, I was just thinking about the world and everything. PHARRELL: Well, you guys are the future. There’s an older generation that feels like they know what the future should be. And then there’s your generation that may have an idea of what the future should be, but that could evolve. How old are you now? JADEN SMITH: I actually just turned 18 last Friday. PHARRELL: Do you guys ever feel any generational divide when you have a conversation with older folks? WILLOW: Oh, definitely. It seems like they don’t understand our thought process. Or, like, things have happened in the past that they’re still mad about. We want to accept them and move forward. I mean, I can definitely see things that have happened in the past that they’re holding on to and things that are happening right now that bog them down, but this generation wants to transcend them. PHARRELL: It would be cool if they would remember when they were teenagers what the generational divide was then. Except that the generational divide is much more blunt at this time. You guys grew up online. Part of your life is on social media. And when they look at it as just something to do, they don’t realize that they also essentially live online. They don’t realize that their phone has replaced their wallet. WILLOW: Yep. I know so many kids who literally are, like, Instagram-famous. They have done nothing but post pictures on Instagram. And they have followings. People love to see them in person, but it’s only because they post on their Instagram. It’s literally crazy. Kids will paint a picture of themselves that is so far beyond who they actually are. It’s like they’re wearing someone else’s skin. PHARRELL: I love that there are pros and cons to all of it. I feel like your generation understands that. Some of them abuse it. And some just purely use it. WILLOW: And then there’s people, like me and Jaden, who want to utilize social media to elevate the consciousness of those people who feel like all they want from social media is to be famous. [laughs] Like, you can actually be a voice. You can actually say something that’s inspiring and not just make people feel like you need to buy things and be a certain way. JADEN: It’s good to be happy and tell us how cool your life is and how awesome you are on social media. That’s great because it inspires other people to be happy, too. But a lot of times, people are trying to be happy in the wrong ways—with money or with different things that are not true happiness. It’s leading people down a rabbit hole that actually doesn’t exist. So people think like, “Yo, once I get this money and these cars and stuff, I’ma be so happy.” But that’s not true. And I feel like that’s why it’s very important to educate people on different things while you are actually on social media. PHARRELL: I love it. The positive path and the trajectory that you guys are on, where does that come from? Who are your biggest inspirations? WILLOW: My parents. Growing up, all I saw was my parents trying to be the best people they could be, and people coming to them for wisdom, coming to them for guidance, and them not putting themselves on a pedestal, but literally being face-to-face with these people and saying, “I’m no better than you, but the fact that you’re coming to me to reach some sort of enlightenment or to shine a light on something, that makes me feel love and gratitude for you.” They always give back what people give to them. And sometimes they keep giving and giving and giving. And some people don’t feel like they need to give anything back because it’s like, “Oh, if you’re famous, you can just keep giving, and it doesn’t matter.” It’s not just about money. It’s not just about giving people gifts or whatever. What my parents have given to me is not anything that has to do with money or success or anything that society says people should be focusing on—it’s something spiritual that only certain people can grasp and accept. And that’s how I act and move in the world today. JADEN: That’s we’re trying to get to. Where every kid goes to school, and like 50 percent of children don’t drop out. Where they feel like their teachers are actually on their side. Or they feel like law enforcement is actually on their side. We want to create a society that is working for us and with us—and we’re working for society, not against it. PHARRELL: It’s beautiful that you guys are in such lockstep. Willow, you once said that you felt like the two of you were almost like identical twins, like you could finish each other’s thoughts. Were you guys always that close? WILLOW: Yeah. It’s crazy, the sibling dynamic. I could’ve spent my entire childhood like, “I have to love this person.” And it becomes a chore. But our parents were never like, “You have to love them.” It was more like, “You have your life. He has his life. And when you guys want to come together, when you guys want to commune, that’s up to you.” And throughout us realizing ourselves and realizing each other, we just opened our eyes and were like, “Damn, you are the yin to my yang.” Not a lot of siblings have that opportunity, because they’re always being pushed together so much. They need their time apart in order to realize themselves and realize who they are. PHARRELL: Has there ever been, like, some love-based competition? 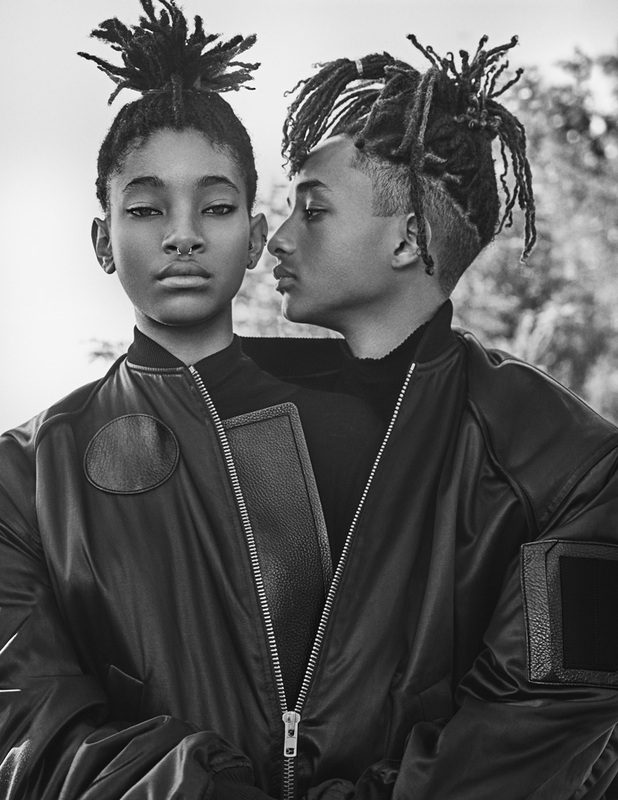 JADEN: We never really felt competitive because Willow’s always been better than me at everything. There’s been no competition. WILLOW: [laughs] Pharrell, that is so not true. JADEN: Willow started making music first. I was like, “My younger sister is, like, 4, and she’s making all these fire songs. What’s happening?” Willow was doing all these things, about to have record label deals at like the age of 6, and I was like, “I feel like I’m underachieving.” That was around the time that I was doing Karate Kid, and I could do flips, and I thought I was special because I could do flips. But Willow could do the flips, too! Willow naturally had it. Like, I was trying to do no-handed cartwheels. Willow had it. I was trying to get to the studio. Willow was in the studio. You know what I’m saying? Willow just didn’t have as big as a passion for acting as me. But if she did, she could do what I did. So there’s always been competition, but we’ve always worked as hard as possible to do the things that we want to do. We never got upset because we could always do the same thing. It happened so that me and Willow were able to go through every level or different section of life that we wanted to. If we wanted to act, we could act. If we wanted to dance, we were dancing. And we could do it on the level that we wanted to do it. So there was no, like, “I’m mad at you.” Well, we would get mad at each other when we were young, but that stopped when we were, like, 9. PHARRELL: It seems that you’ve always been—I hate using this word—famous. You’ve always been easily recognized for what it is that you do. So do you guys separate your public and private selves? PHARRELL: So you do have to censor yourself on social media? Do you also regulate your usage? WILLOW: Definitely! Even for people like us who have an awareness that’s slightly more awakened, it still takes over your mind. And you find yourself randomly going on your phone for no reason, randomly doing things. It becomes compulsive, and you have to start asking yourself, “Whoa, what is the real reason for me checking my Instagram every five minutes? What is the real reason for me posting this photo right now?” I never want to do things impulsively that have no meaning or intent, especially on social media. PHARRELL: Do you feel like it enhances or hinders your creative process? WILLOW: It does both at times. It hinders me when I get lost in things that other people are doing. [laughs] It helps when I can be inspired by things that other people are doing instead of just being like, “Oh, that’s cool this person is doing this.” It’s literally a robotic function, scrolling through your feed and looking at mindless junk that people post every day. There’s no thought that goes into it. There’s no productivity in that. I’m all about looking at things and analyzing things and finding the beauty in it, even if you don’t have to really analyze it. When I can see someone that’s posting the way that they’re thinking about what’s happening in the world right now or even art that they’ve created, it inspires me to do the same. It makes me turn off my phone and go paint a painting or go hike a mountain or go record a song. Those are the kind of things that social media helps me do. But it also can make me sit in my room and not do anything. PHARRELL: I think that’s true for everyone, at least those who are aware. You can only point it out if you’re aware, if your eyes are open. We must stay woke. Do either of you have a dream role or a dream artist collaboration or a dream director that you’d want to work with? JADEN: I would love to work with Christopher Nolan, 100 percent. It would be a dream for me to hang out with you in the studio. Not even to make music but just hang out. PHARRELL: Well, you guys know the power of speaking things into existence. You’re more than welcome. WILLOW: One of my dream collaborations is to work with a band called Hiatus Kaiyote, because their music is so beautiful, the changing of the time signatures. Nai Palm, the vocalist, I have such an affinity for her voice. And everything that she talks about in her music and everything that she stands for is just so beautiful. And, like Jaden said, not even making music all the time, but just seeing how they live their lives and observing them as a spirit and as a human, it’s so beautiful. PHARRELL: So how did your interest in fashion begin? I know it’s a really lame question. But I’m sure people want to know at what point you recognized that you wanted to do it. WILLOW: Me and Jaden, when we were younger … [laughs] Ooh! We would wear the craziest things. Jaden would only wear his Spider-Man costume. I would freaking mismatch every single shirt and pants in my closet. We would just be so rambunctious with our clothing choices. 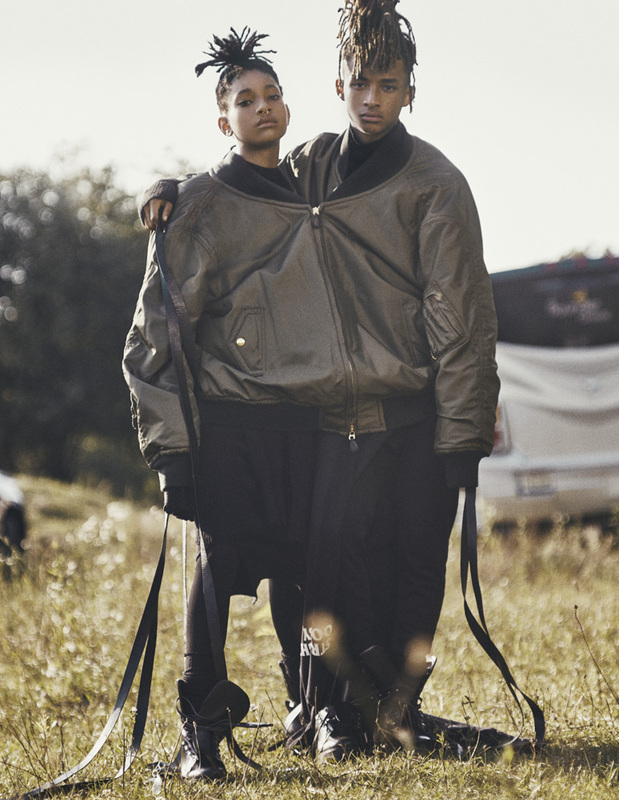 And when we were old enough to start dressing ourselves, my mom was like, “Are you sure you want to go out like that?” And me and Jaden would be like, “You know what? Yes.” And she’d totally accept it. I feel like that’s where most of our confidence comes from. Because we weren’t told, “Oh, you don’t look good in that. You look crazy. People are gonna think this about you.” Like, obviously, that was going to be happening regardless, but it wasn’t like that ruled what we did or the choices that we made. 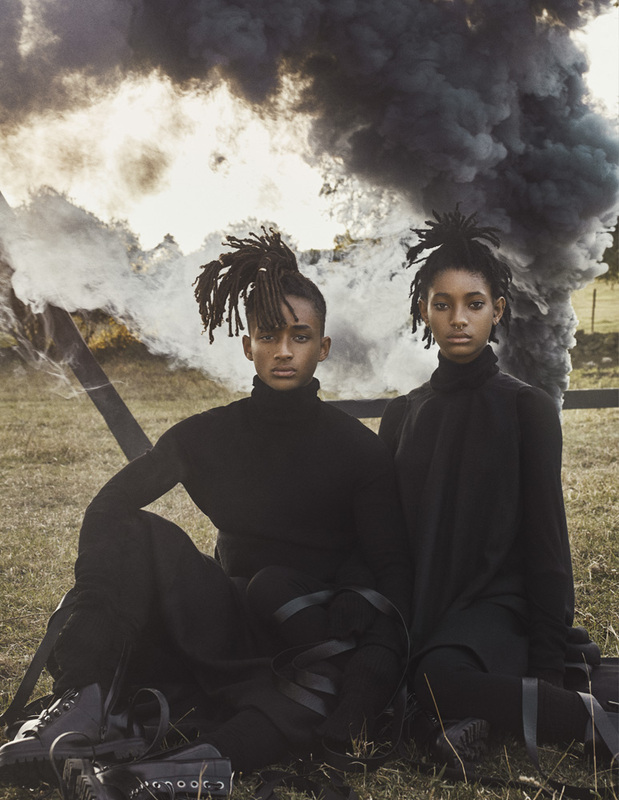 JADEN: Nobody knows that Willow and I were much, much cooler before. Like, before people were looking at the things that we were doing, we were so much more, like, method with fashion. We really went all the way. We went the extra mile on everything because there was no one looking at us. We’ve been through the roof, with ludicrous fashion ideas since we were extremely young. PHARRELL: Well, it led to being a Chanel ambassador and the face of Vuitton, no? JADEN: We’re so blessed! And we’re so, so proud. And thankful. WILLOW: If we didn’t have the kind of exposure to the world that we do now, people wouldn’t hear the positive thoughts that we have. It’s amazing to be able to work with iconic people and to have my name on something that’s so beautiful, but at the same time, the only reason why I do it is so that I can have more of a reach to different kinds of people and spread my message. The only thing that really matters is spreading love and light and acceptance and unity throughout the entire world in any way that you possibly can. PHARRELL: So who are your favorite philosophers? WILLOW: I love Osho. I don’t know if you would call him a philosopher; I would just call him a really cool dude. Osho really changed my life. Because the way that he spoke about emotion and the male and female energies in the world and how people react to the world around them, it’s so simple, yet it has such a depth. JADEN: I feel like that’s accurate, the entire collective is very strong. And it made us realize that being aware in the moment of right now is just the most important thing. All of our issues come from us not being aware enough or not seeing through our problems to the depths of the issues. PHARRELL: Do you guys have any philosophical questions that you’d like to present to the world that’s going to read this? JADEN: A question I would like to present to the world is: Where is the love? And what are we doing? Who’s making the decisions that are putting us in the predicaments that we are in, with all of these people losing their lives around the world in so many different ways? I feel like a serious revolution needs to take place in order for human beings to evolve in a way where we can truly exist as a society. Because, right now, we do not act as a true society. We act as a world under terror, just scrambling to survive. WILLOW: That’s definitely one of my biggest questions. Another is: How are humans going to start taking responsibility for the actions that they take? When are we going to stop pointing the finger at someone else for something we do unconsciously? How are we going to start being aware of those things and changing those things? 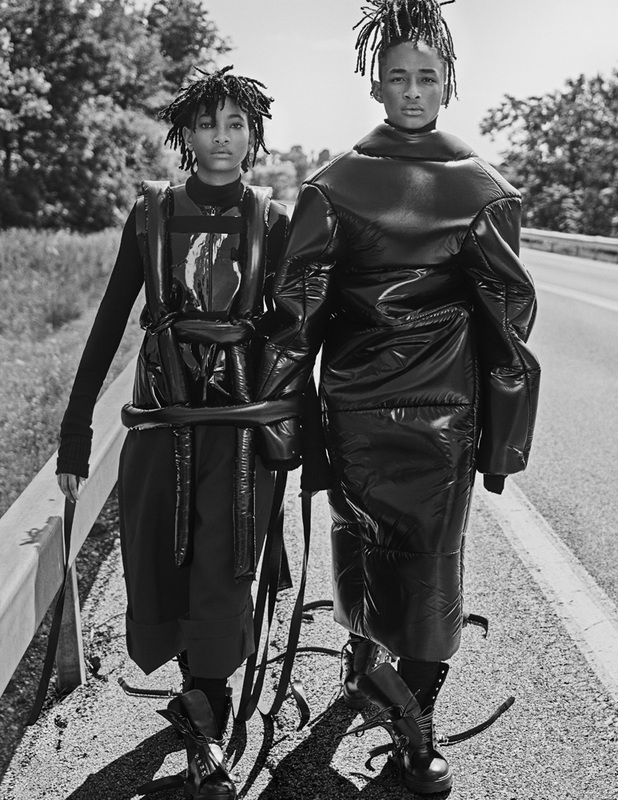 In addition to their interview, Jaden & Willow posed for an incredibly photo spread shot by Steven Klein.